Sharon Godfrey, Corporate Parenting Team manager, stated: “I started in this role in June 2015. I was previously with Milton Keynes Council in the mid-1990s. It’s a bit like a family as everyone knows everybody, so people tend to stay. Milton Keynes is a creative authority – they think outside the box. I’ve worked in several other local authorities and culturally they are a bit stuck, whereas Milton Keynes will be creative and respond to the need of the community with which they are working. Graham Taylor-Paddick, Corporate Parenting Team social worker, told us: “I’ve been here for two-and-a-half years and I live in Aylesbury but it’s well worth the commute. I’ve worked for archaic local authorities in the past but in Milton Keynes things get done a lot quicker and more efficiently. Tara Daily is a newly qualified social worker (NQSW) in the Corporate Parenting Team. 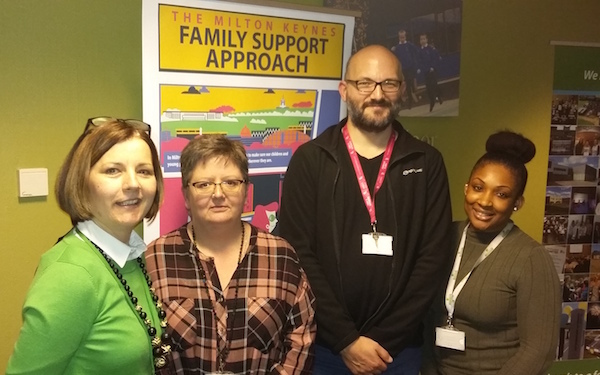 Tara commutes from Northampton for her role but she explains why she will stick around for a long time in Milton Keynes: “I’m a newly qualified social worker on the Assisted Supported Year in Employment programme. It’s a year-long programme and you get protected caseload, which is an added bonus. As a NQSW in Milton Keynes, you aren’t just thrown into it, there’s a lot of support. Once agency workers experience Milton Keynes, they tend to apply for a permanent post, which has contributed to a reduction in agency staff to below 10% of our workforce. Once they’ve been here three months they often say, I’m going to apply for a permanent job. The benefits of being here permanently far outweigh the benefits of having immediate cash on a weekly basis. Amanda Dickson-Lewis, senior practitioner in the Family Support Team, transferred from an agency worker to become a permanent social worker. She said: “Having been a locum social worker for a number of years I decided to seek permanent employment with Milton Keynes Children’s Social Care as a result of my positive experience of working here. Managers are supportive and approachable and have good insight in to the needs of their team members. Is IR35 tipping the balance? When you work within our Children and Family Team, you are joining a department with an innovative approach to social work and strong family support ethos, not only committed to supporting children, young people and their families, but also to every member of our close and successful team. We are currently recruiting for qualified social workers at various levels and we would welcome you to view our careers page and register your interest for current roles or even for future roles.